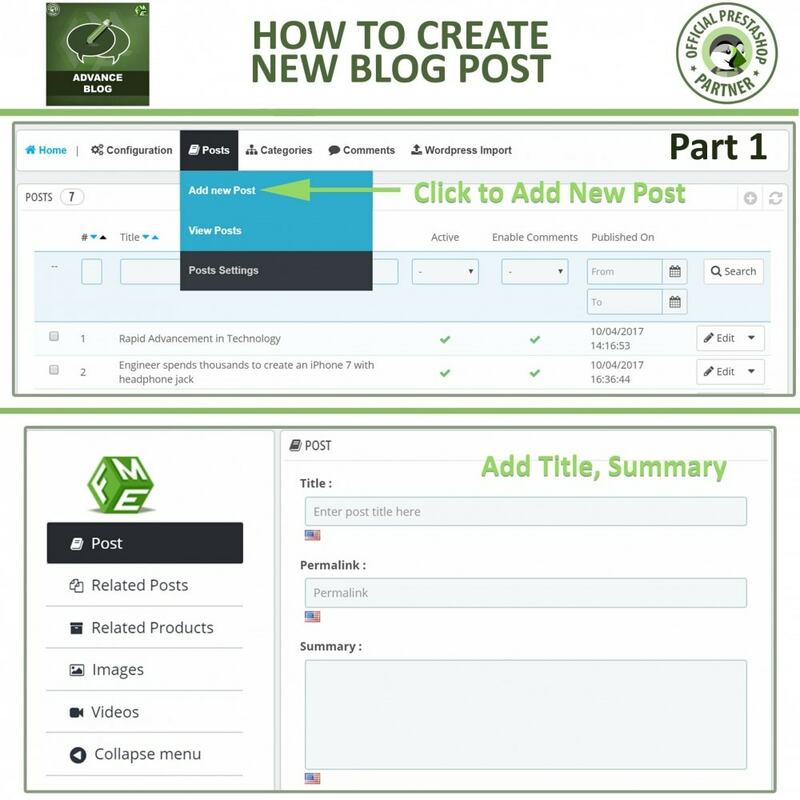 Connect with your customers using a blog, no need for an extra CMS platform. 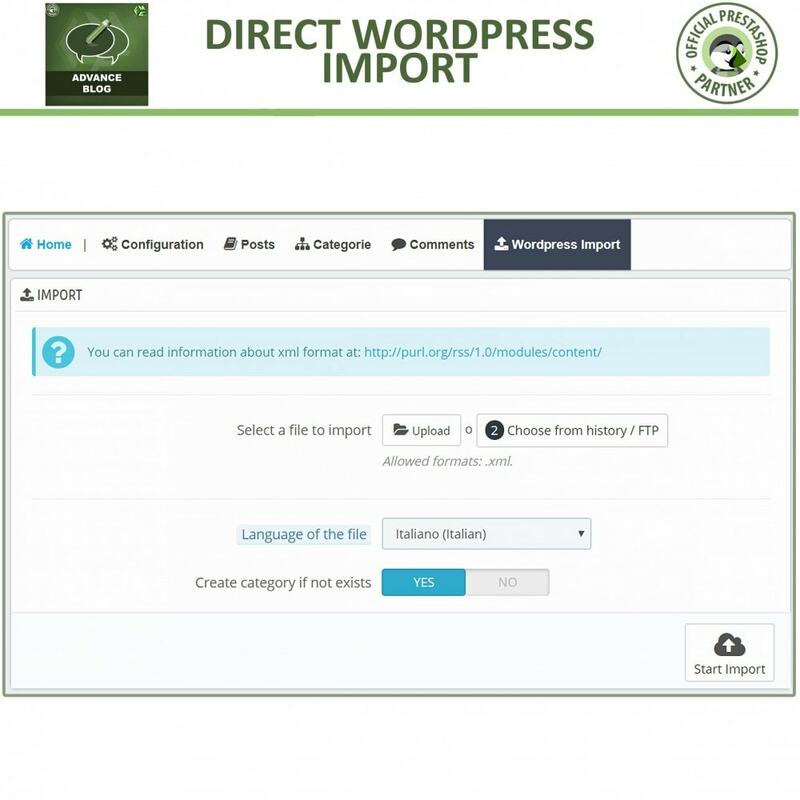 Another useful option offered in this Prestashop blog module is that you can import your WordPress blog posts. 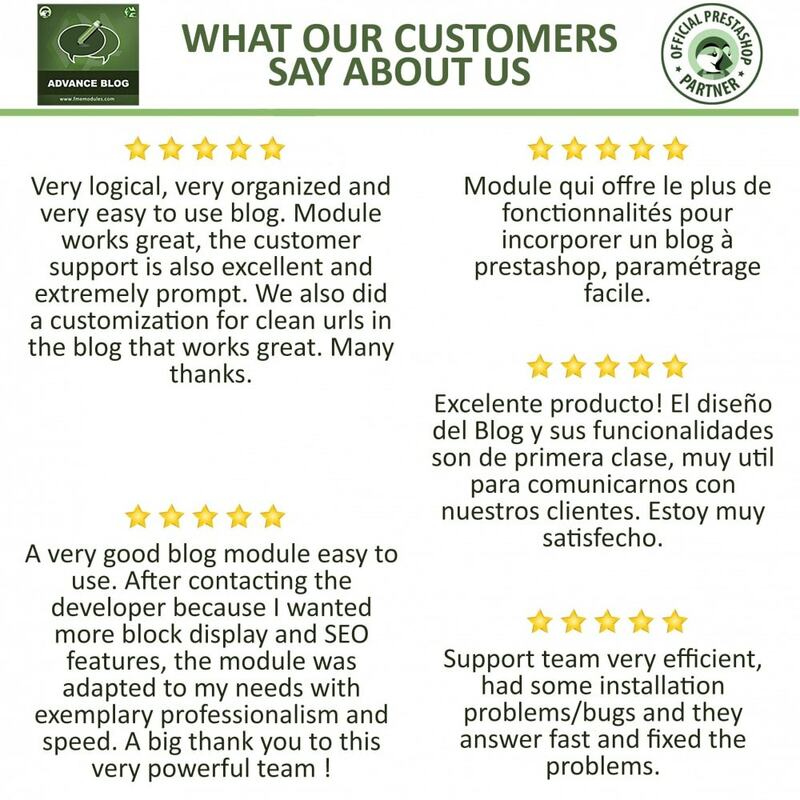 Prestashop blog module is 100% responsive & mobile friendly. 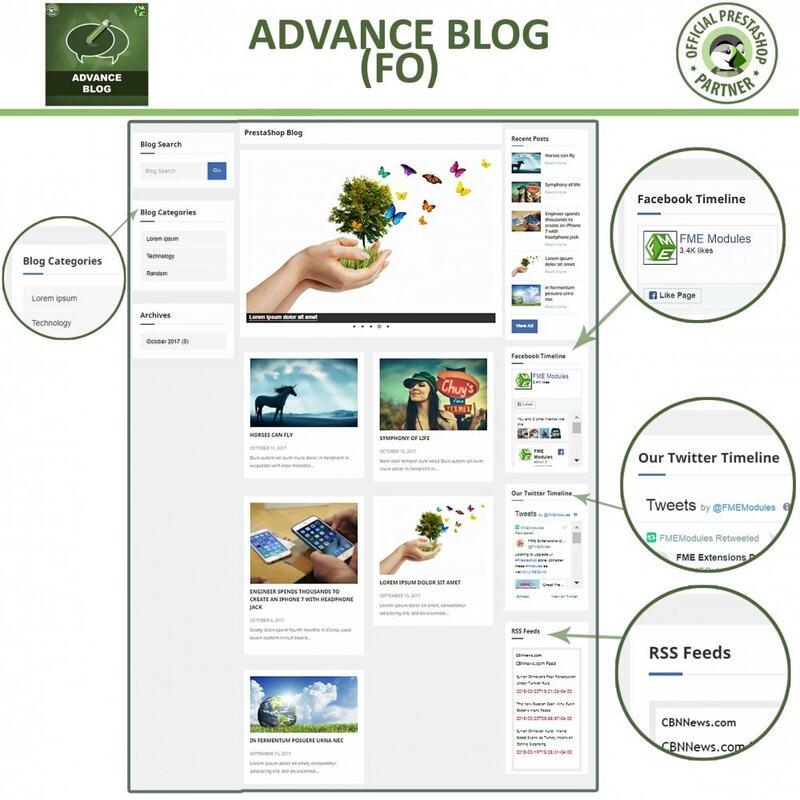 Option to show your latest twitter and facebook feeds/posts on the blog. 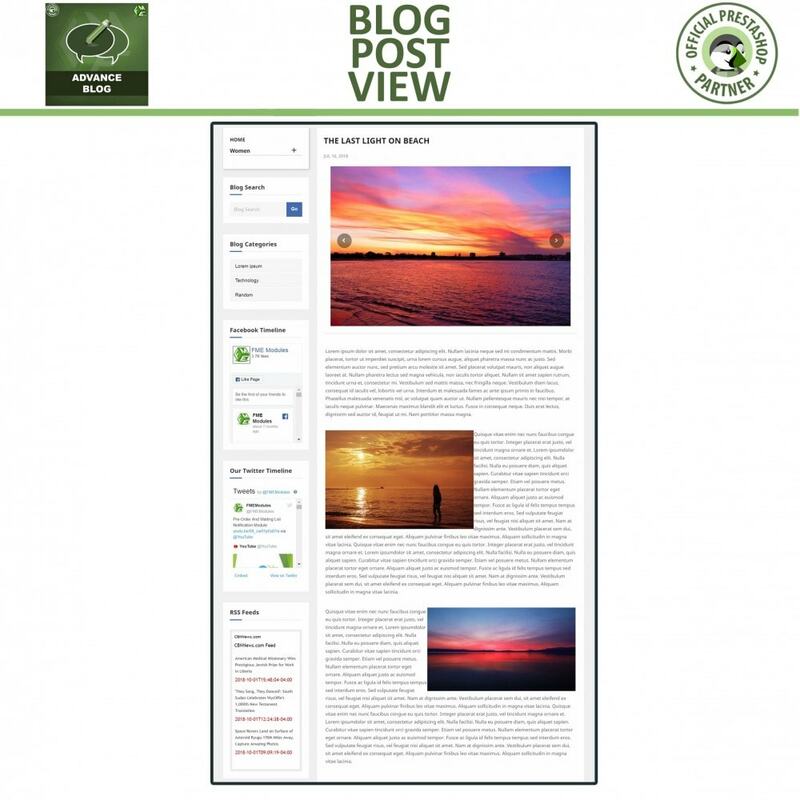 There is also an option to show Third Party RSS feeds and share latest updates right from your blog. 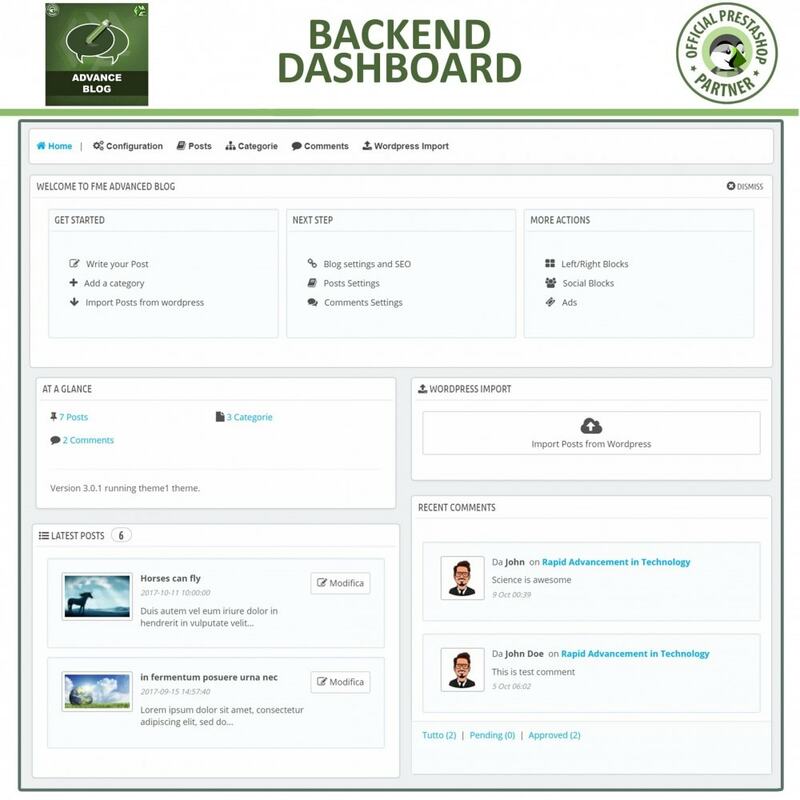 Our Support is rated as 2.85 out of 3 by Prestashop based on our previous support history. 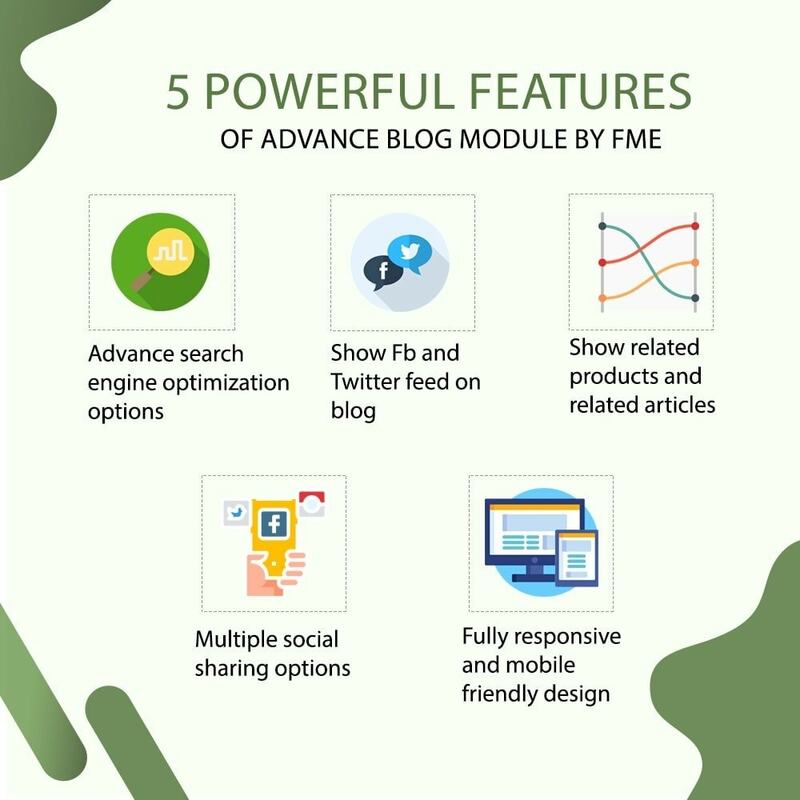 FME PrestaShop Blog Module comes with SEO rich features to add Meta title, keywords & description of every blog page as well as an individual blog post. 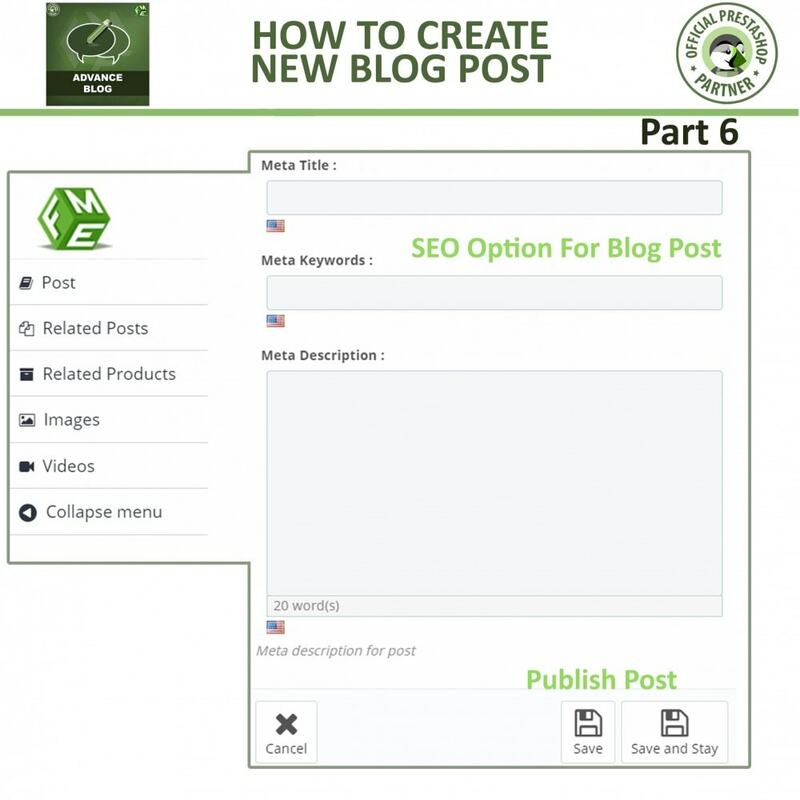 No need for your customers to create a separate account to share their feedback on blog posts. 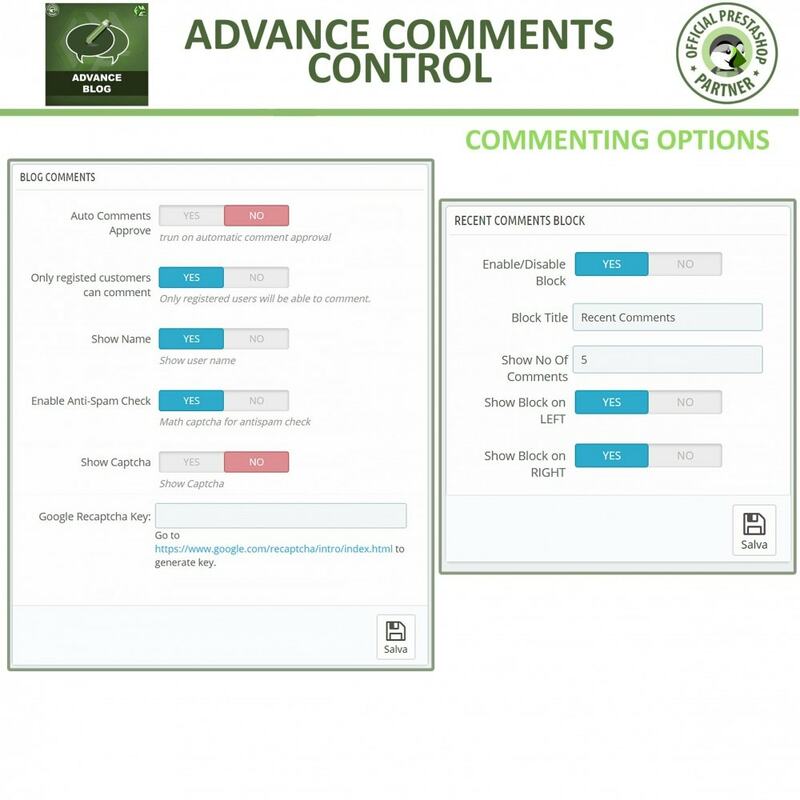 Enable facebook commenting options. 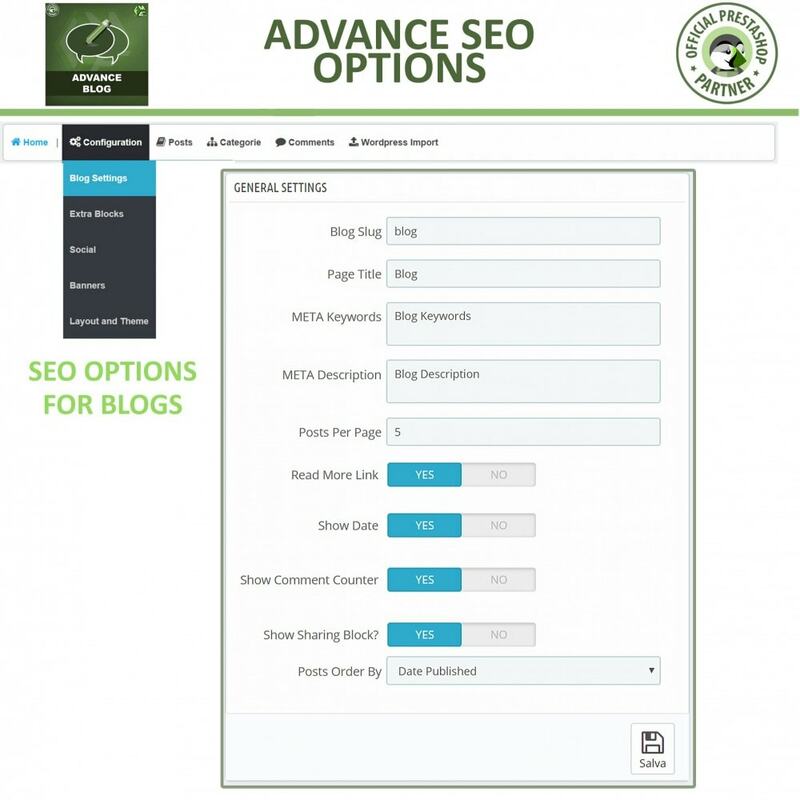 Auto spam check option for the blog. Add captcha to prevent bot comments. 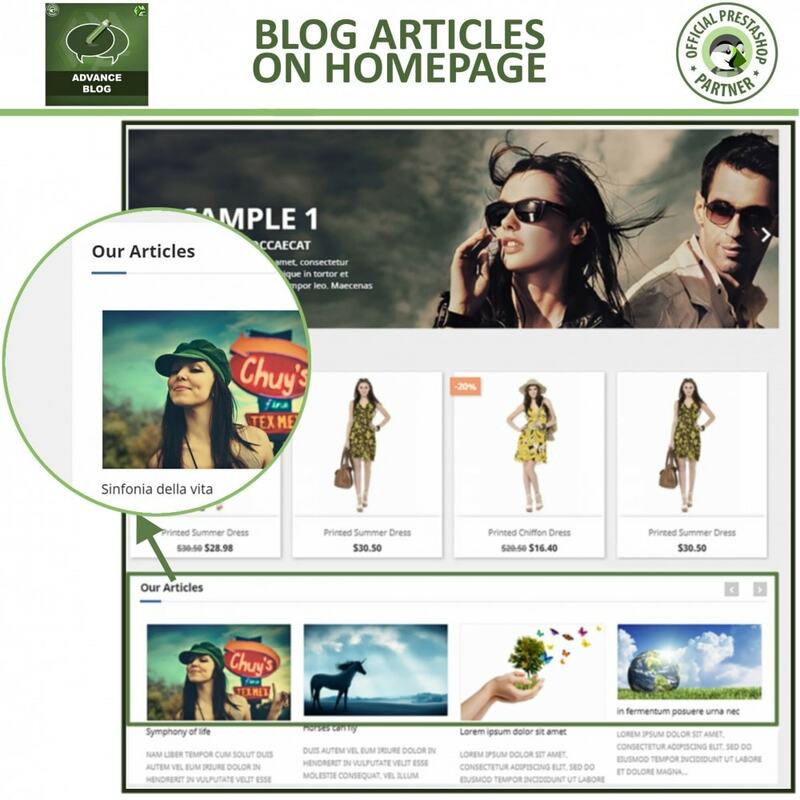 Engage your visitors by showing them related blog post and encourage purchase by attaching related products. 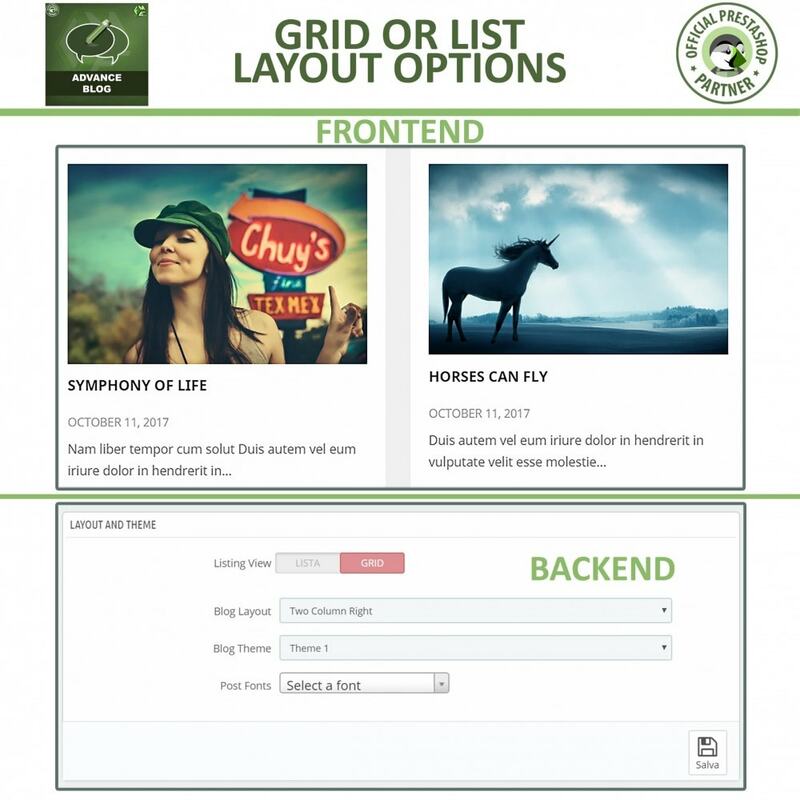 This PrestaShop Blog module has been developed by FMEModules - Official Prestashop partner with experience in developing 45+ modules. 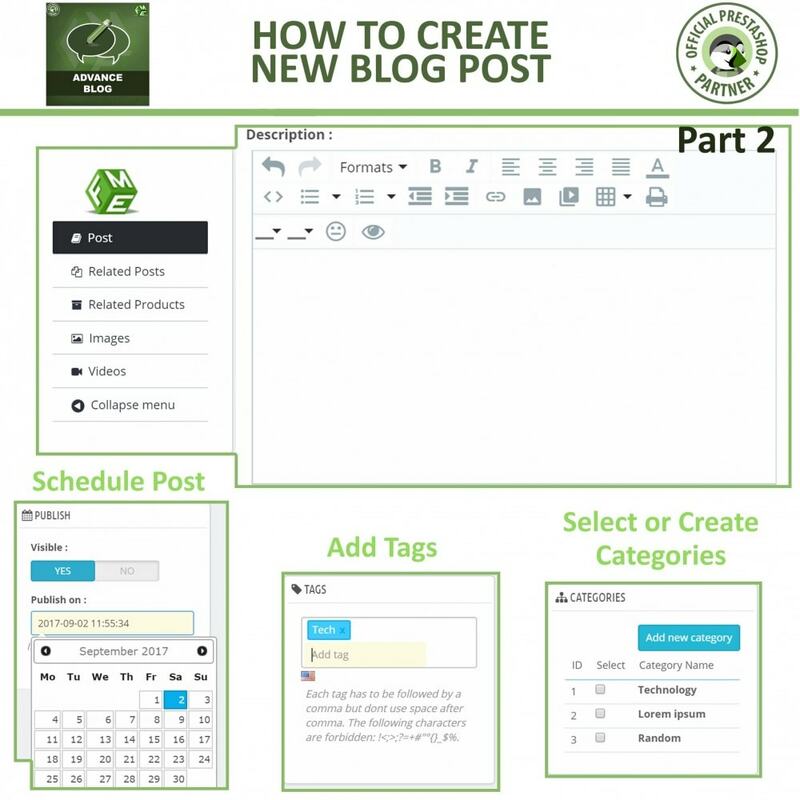 Customization options allow you to configure the basic blog design settings to make the blog more attractive and captivating. 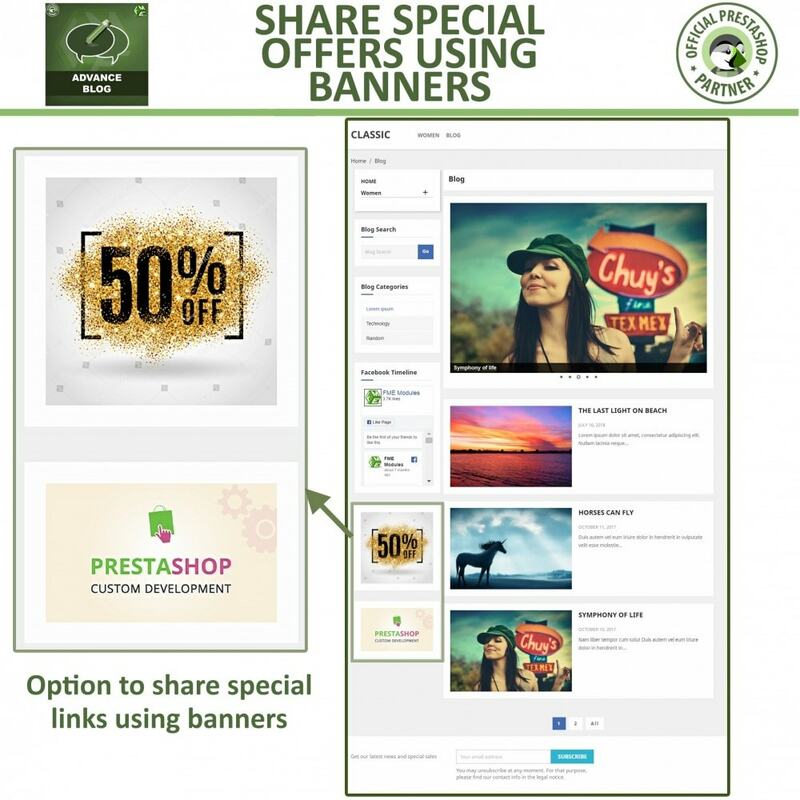 Our Prestashop Blog Module gives you the option to add a social share button for encouraging readers to instantly share your blog content with their family and friends through all social networks. 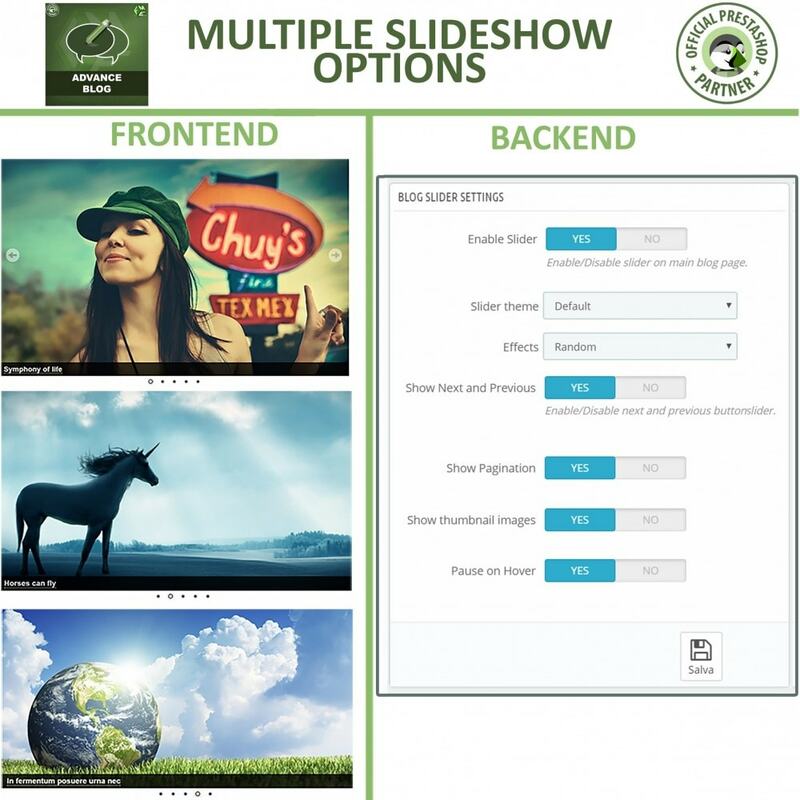 The ‘Share This’ option allows quick sharing to prominent social media channels such as Facebook, Google+, Twitter, Pinterest, LinkedIn, Tumblr, Pocket, Reddit, etc. 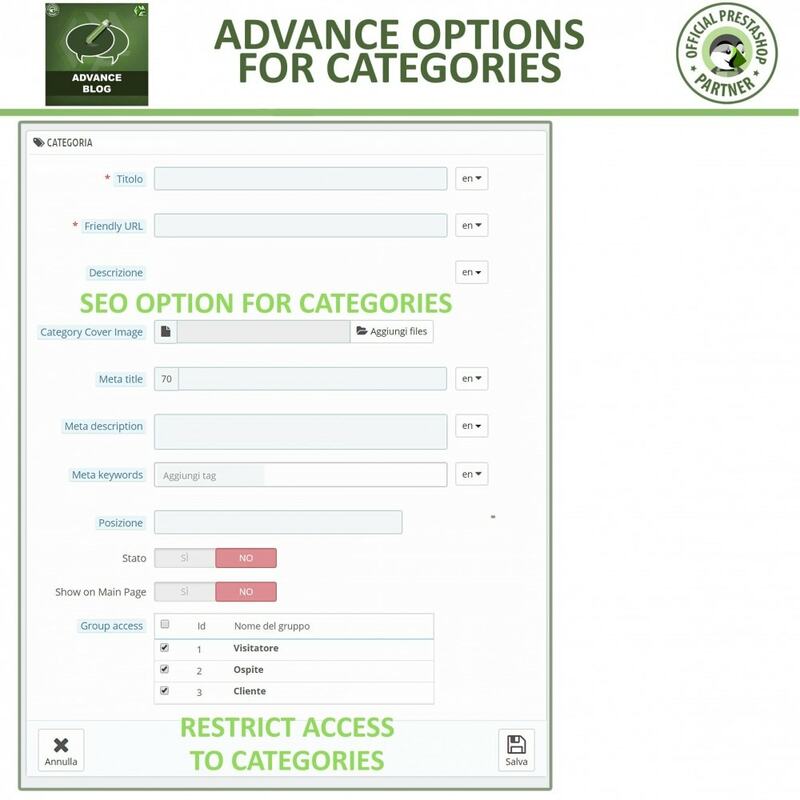 These are optional block features that you can enable/disable any time from backoffice of blog module. 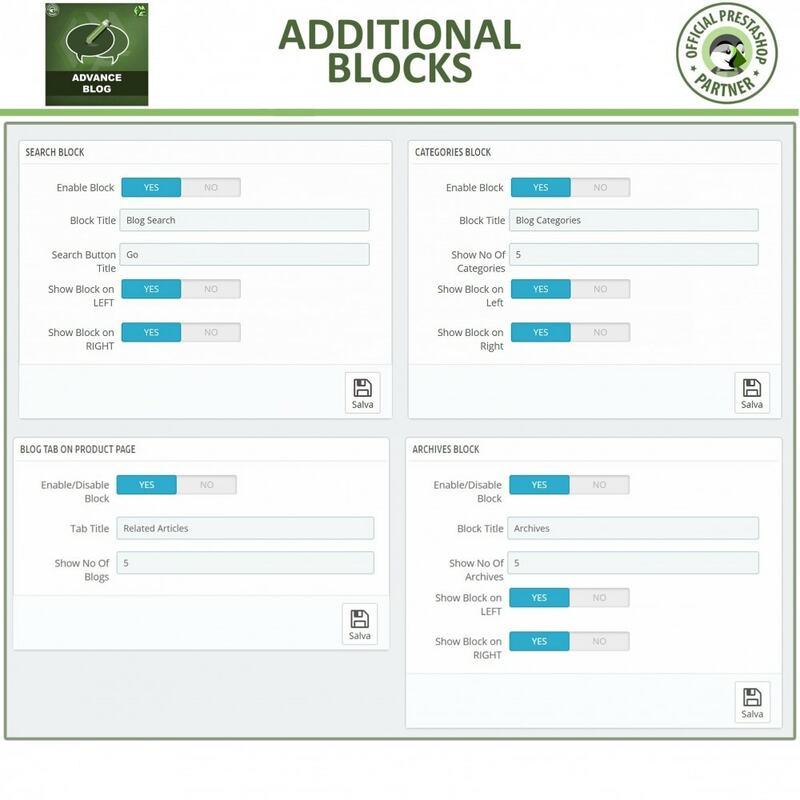 You can position these blocks on either the left or right side. 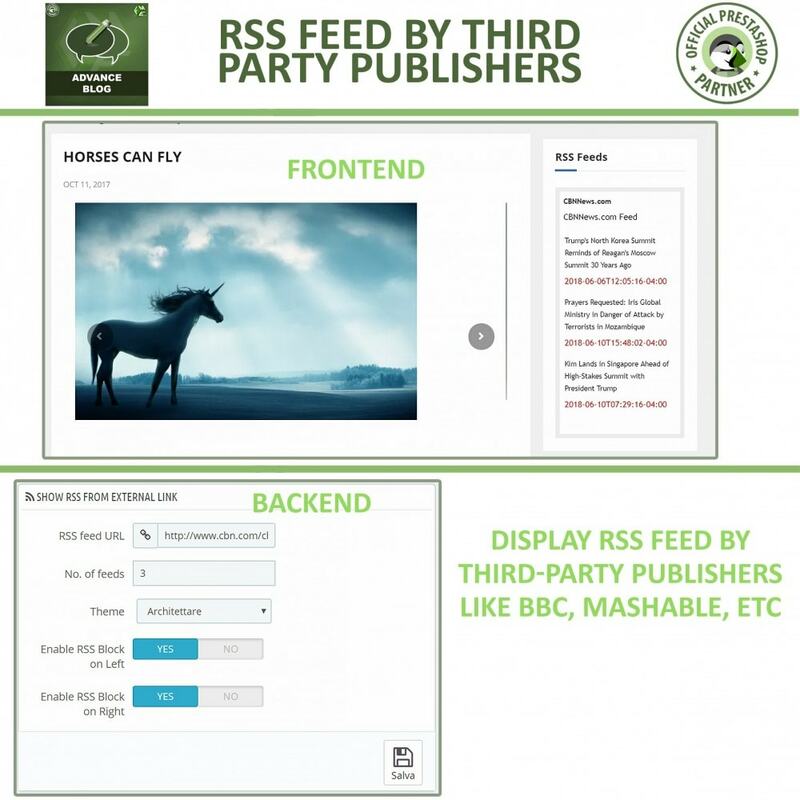 Display RSS Feed by third-party publishers like BBC, Mashable, etc. 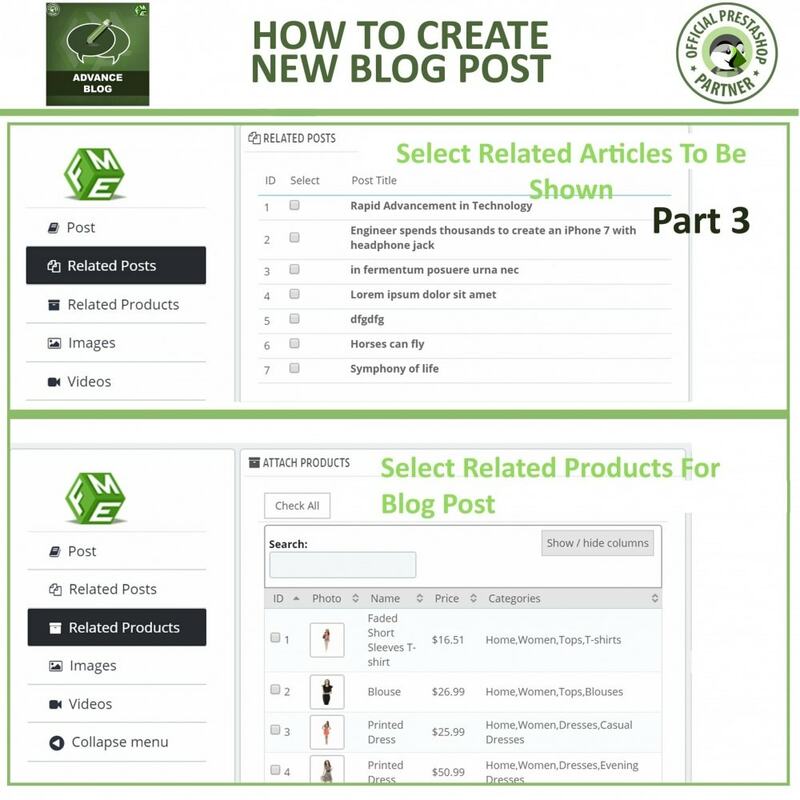 Customers can browse blog posts and articles about the products they are about to purchase as they are often ignorant about the additional features. 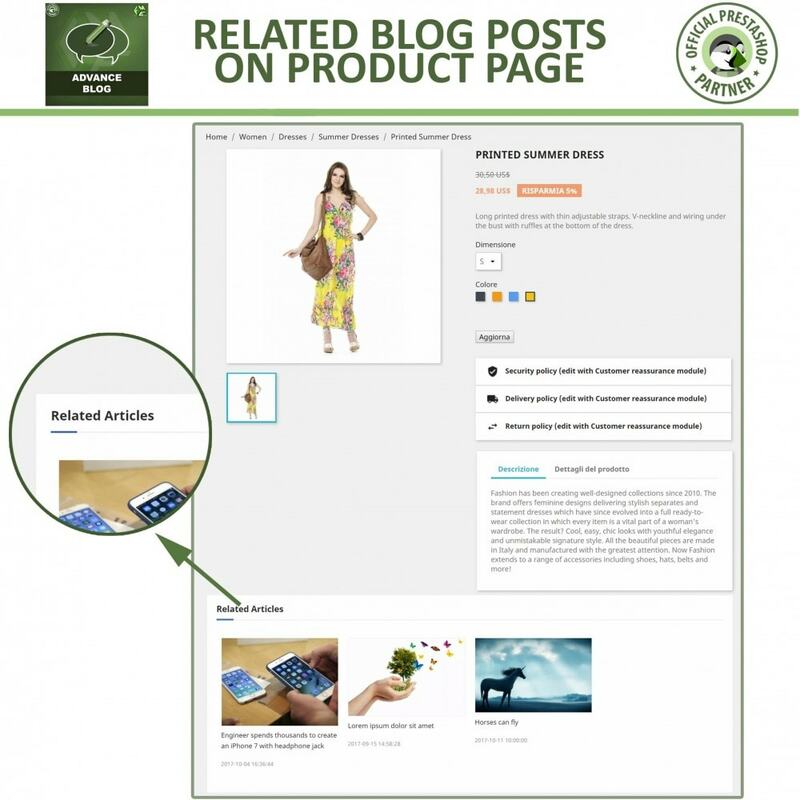 Adding meta details offered by our PrestaShop blog module to articles help your rank the content higher in search results so your targeted audience can easily find them while searching in their browsers. 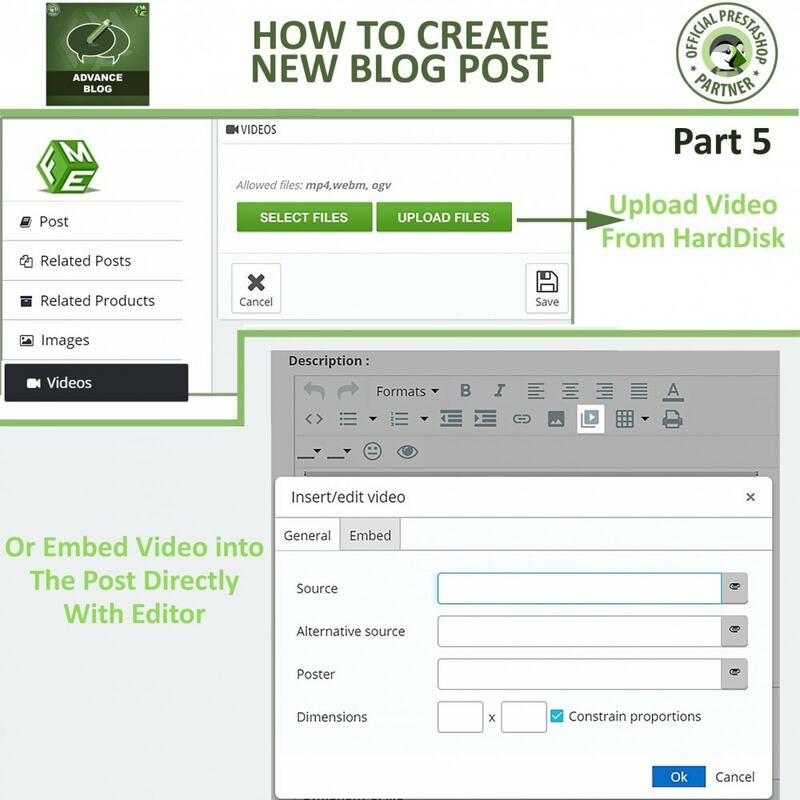 The informational and compelling content written exclusive for customers help them to simplify making a purchase decision.